A friend of mine is planning a pilgrimage to the Holy Land later this year. Thinking I should show solidarity I undertook my own reverential expedition. Fully cocooned in both awe and reverence (figuratively) I packed up my Yaris and headed north. At about four o'clock that afternoon, I came upon the city and began doing circuits within its boundaries due to confusing satnav directions and the streets being filled with great joyousness as other pilgrims celebrated St Patrick's Day. The crowds made for some tricky lane changes and I became lost in the wilderness (of the city). With some luck (divine guidance?) I found St John's (Shopping Centre and Car Park) and then went looking for a room at the Inn – The Holiday Inn. Next morning I was up early (for me) and waiting for my spiritual guide and guru. Then, with two other votaries, we headed off to bask in the glory that is; The Beatles. For my pilgrimage, I had chosen Pool of Life Tours', Beatles Extravaganza Day Tour at a cost of £115.00. The tour ran from 9.30 am until 4.00pm. The guide's name was Rick who turned the day and my choice of tour into what can only be described as, 'Inspirational'. But then I don't know anything else - there could be others out there just as good; but, I doubt they'd be better. First stop was at Hope Street and the Liverpool College of Art where John Lennon went to school. Also at the location was the suitcases' sculpture of luggage intended to depict baggage associated with The Beatles and their history. 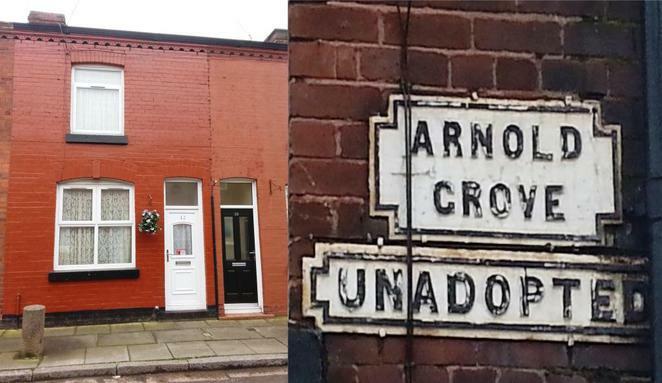 Then on to 10 Admiral Grove, Dingle where Ringo grew up. The whole area has gone to rack and ruin but, fortunately, it is currently up for renovation. Apparently, local Liverpudlians can enter a lotto and, if selected, purchase a renovated house for £1; they must then live there for five years So some lucky person is going to eventually buy Ringo's old house for £1 – how good would that be? 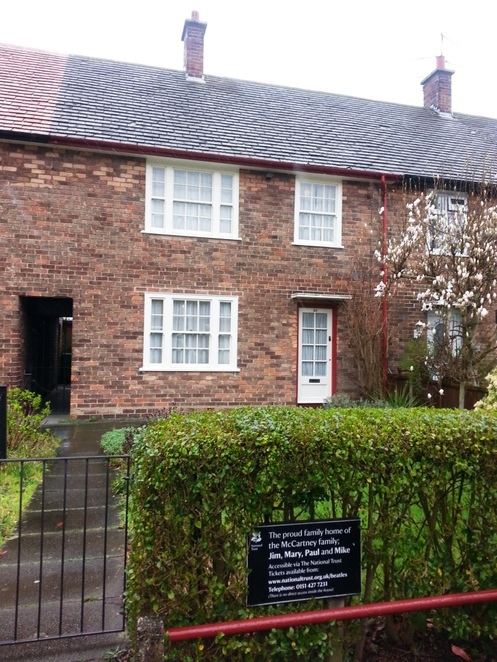 Interestingly the owners of the house across the street, where Ringo spent a lot of time as a youngster, had been refused permission to turn it into an attraction. 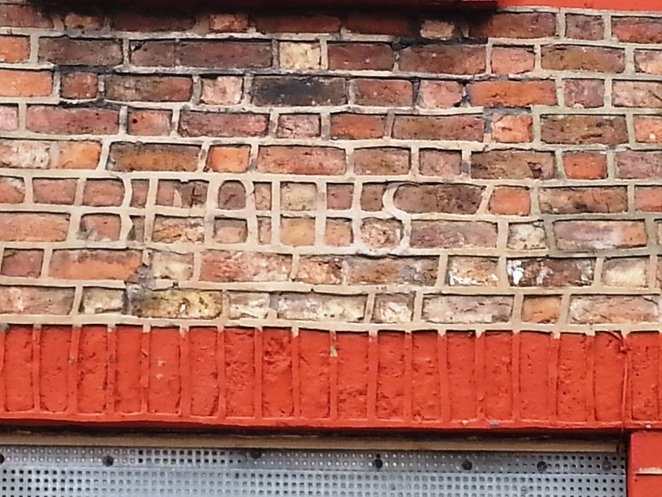 So, to make a statement, the owner did a bit of creative DIY in the pointing of the house's brickwork. Then he explained how nurses used to sell poppies to raise money behind, "… the shelter in the middle of a roundabout." He also explained the line, "And though she feels as if she's in a play, she is anyway." But I've forgotten how that fits in. Absolutely incredible to see how the song fits with their lives and to get a glimpse of what others who knew the area must have felt when they listened. 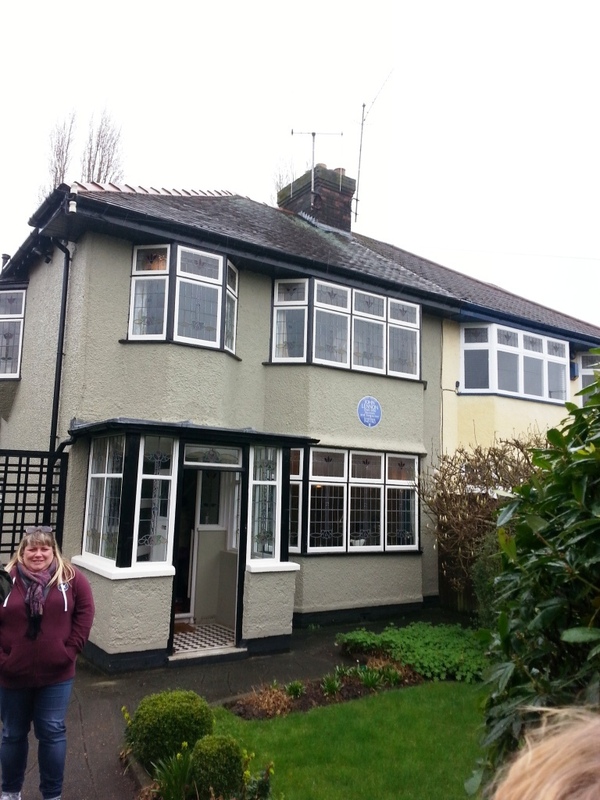 Next we stopped around the corner at 9 Newcastle Road, Wavertree where John Lennon lived with his mother. 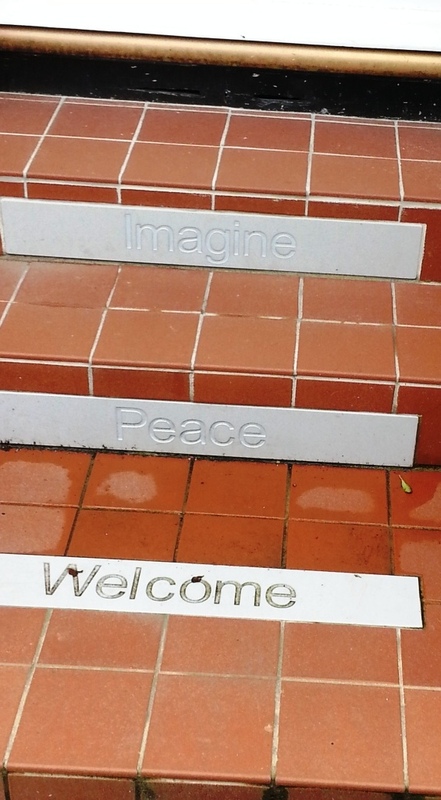 The steps to the front door have a memorial to the great man. George's home was next. The house is still in use so we just took a photo and moved on. Rick, the guru, revealed how when George stayed in hotels he used an assumed name – check George's address and see if you can figure out his alias. 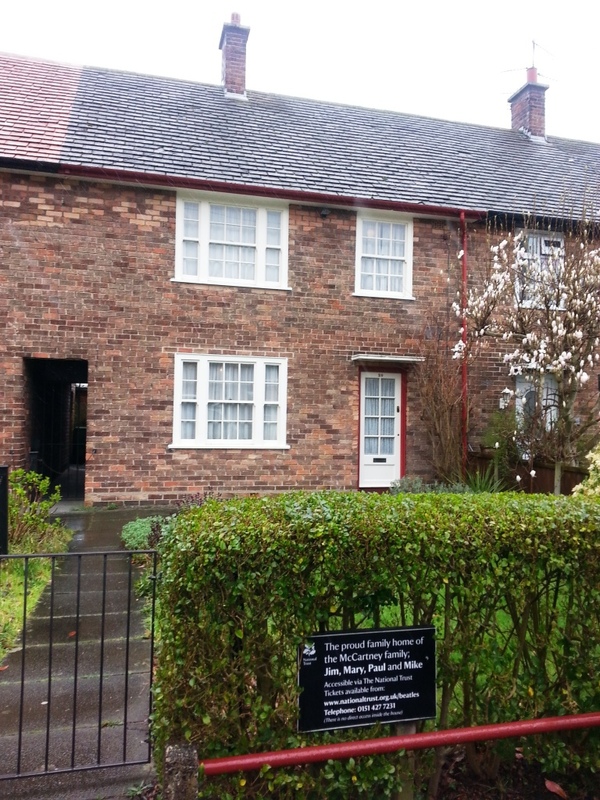 Then to 'Mendips', 251 Menlove Avenue, Woolton for a guided tour of John Lennon's, or, actually his Aunty Mimi's house. Here we joined a group of National Trust tourists and was disappointed to learn no photos were allowed inside the house – not to worry; I have my memories. Then still with this group we were bussed to 20 Forthlin Road, Allerton; the McCartney family home. This is also a National Trust property and so, again, memories only. Both National Trust tours were very, very interesting. It was also good to see how they lived and how it was very much like the rest of us at the time. 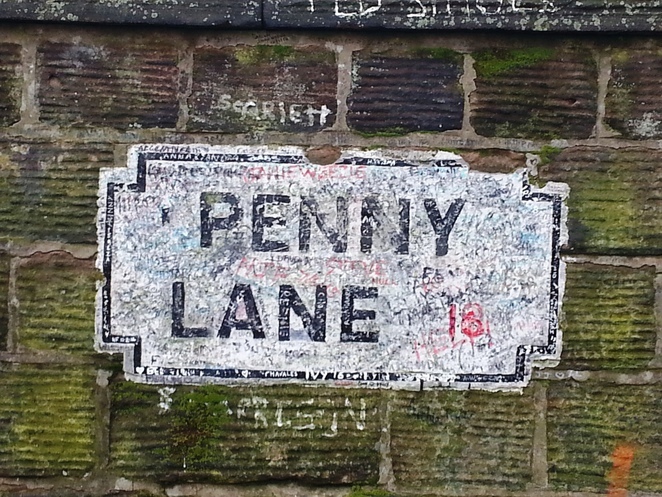 Then off to see some of the other places that figure in the Beatle's story. We went to the churchyard where Eleanor Rigby is buried along with her name (and several other family members). 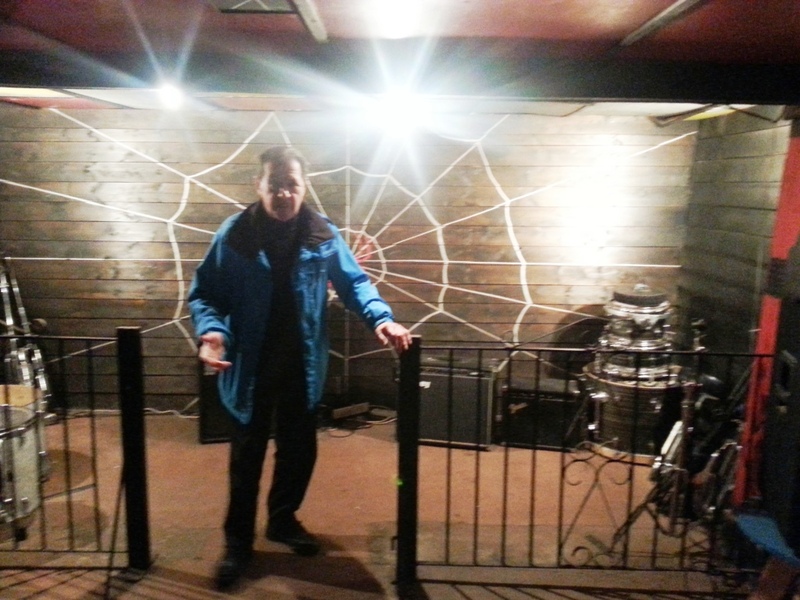 Then down the road to St. Peter's Church Hall where John and Paul first teamed up. I know this because Rick told me and there's a plaque that commemorates the meeting. 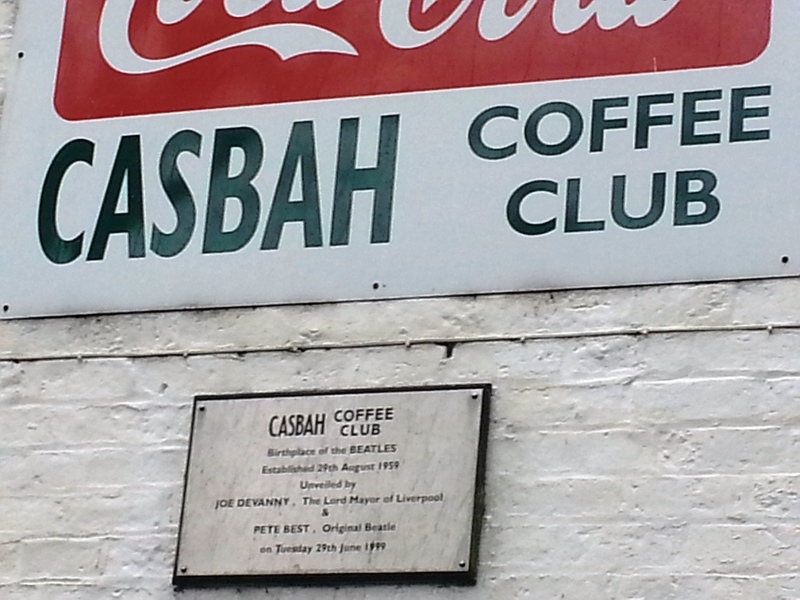 We saw the gates to Strawberry Field on our way to the Casbah Coffee Club – the actual birthplace of the Beatles. Again, I know this because of the plaque on the outside wall. The Casbah was set up in her basement by Mo Best, mother of Pete Best, the Beatles' first drummer. The lads (sans Ringo) helped set the place up and did a lot of the painting as explained during the tour conducted Rory Best, Pete's brother. And that was it, one of the best days of my life was over. Will I ever again feel the delight, the ecstasy or the simple joy I had in walking in the footsteps of greatness on that day? It was a day of euphoric wonderment for me. I was totally engrossed and loved every minute as evidenced by the fact that, not once, did I eat, drink or answer nature's call (which, for an old man, shows focus!). A day to really remember and well worth the effort for any true fan of The Beatles. My life is now complete! Well done with your Milestone, Tony! Loved the humour in your article!